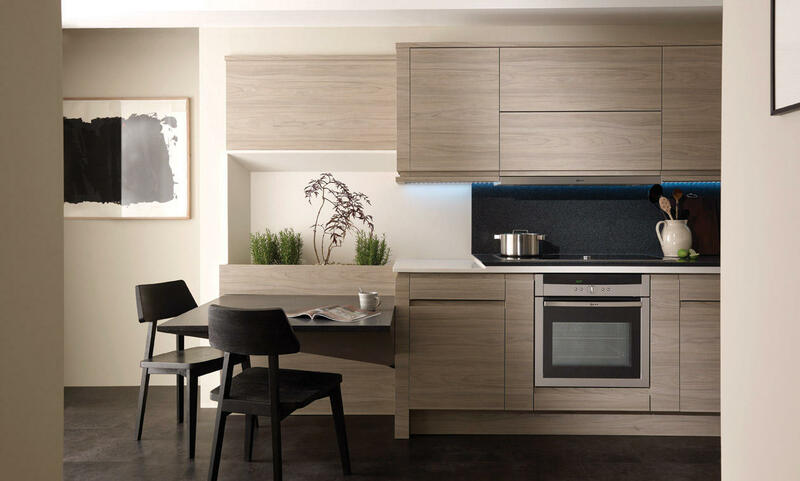 Offering a truly remarkable and contemporary twist on a classic wooden kitchen, the Remo Elm creates a stunning ambience for your new kitchen design. This stunning shaker-style kitchen prides itself on offering an unrivalled selection of storage space opportunities, without compromising on its flawless modern look and feel. With a stunning light-wooden effect, the gorgeous Remo Elm contemporary kitchen is a remarkable hue of light brown, finished with an incredible grain-effect, which creates a beautiful and deep neutral palette upon which you can build the colour scheme for your kitchen. The uber cool handleless design of the Remo Elm contemporary kitchen offers a truly seamless finish for the beautiful cupboard doors. Creating a smooth finish, your sleek kitchen design looks incredible. There are a host of upper and lower cupboards, each finished with a smooth design that adds to the incredible ambience of your Remo Elm kitchen design. There’s a gorgeous squared-off faucet section with a built-in sink adding an extra touch of sophistication to your new kitchen. Plentiful cupboard space ensures that any of your kitchen accessories and food preparation tools have a home to live in, helping to upkeep the cool and clutter-free appearance of your Remo Elm contemporary kitchen. Finished with a glossy white kitchen surface, you’ve got a beautiful contrast from the light wooden tones of the elm cupboards. As with all Number One Kitchens’ kitchen solutions, you can customise this area of your design too, choosing a work surface that perfectly suits your dream kitchen design.